James J. Gruccio, Sr., President of the law firm of Gruccio, Pepper, De Santo & Ruth, PA, is a lifelong resident of Vineland, New Jersey. He graduated from St. Joseph’s College, Philadelphia, Pa. with a Bachelor of Science in International Politics. He obtained his law degree from Villanova University School of Law. Mr. Gruccio began his law career as a partner in the firm becoming president in 1972. He served as the Prosecutor of the City of Vineland for 8 years. He also served as the Vineland Solicitor and Director of the Legal Department. Other professional positions held by Mr. Gruccio include Vineland Economic Development Solicitor; Member Board of Trustees of the Delaware Valley Council; Chairman Regional Board of Directors of First Peoples Bank of New Jersey; Member Federal Magistrate Appointment Committee; and Solicitor of the Landis Sewerage Authority. He currently continues to serve higher education at Villanova University Charles Widger School of Law as a Member on the Scarpa Center for Law and Entrepreneurship Advisory Board and as a Member of the University’s Board of Consultors. He has been a Board Certified Civil Trial Attorney since 1985. The areas of his practice include general counsel to numerous private corporations, limited liability companies, and other business entities including banks, insurance companies, and physician IPA groups. 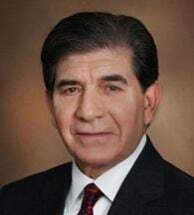 He has been personal counsel to Superior Court and Municipal Court Judges, as well as to attorneys and physicians in disciplinary proceedings before various professional review boards. In addition, he has been trial counsel and general counsel in business disputes, shareholder disputes, corporate dissolutions, oppressed shareholder litigation, and personal injury and products liability litigation. Mr. Gruccio enjoys an AV Rating in a national attorney rating service which signifies the highest possible rating by his peers based upon experience, the nature of the practice, and qualifications relevant to the profession. The rating also indicates faithful adherence to professional standards of conduct and ethics. He is a perennial selection as a New Jersey Monthly magazine Super Lawyer (general litigation) and is routinely appointed by various Courts as Special Discovery Master and Fund Administrator. In addition to his General Equity litigation and business practice, Mr. Gruccio is actively sought as a Mediator in both Court-referred as well as private mediations of complex cases, utilizing combined problem solving skills as Mediator and Board Certified Civil Trial Attorney in utilizing both proactive and remedial action to resolve acute disputes. Mr. Gruccio was a Charter Member of the Board of Trustees of the Big Brothers of Vineland Association; Member of the Police Athletic League Board; Sponsor of Annual Awards Dinner for Boy Scouts of America; Fundraiser and Volunteer for the American Heart Association; American Cancer Society; Boy Scouts of America; and Sacred Heart Church, Vineland, New Jersey, Building Fund. He has served as a Lecturer in the Civil Trial Practice Classes at the Widener University School of Law and has taught Paralegal Courses at the Cumberland County Community College.